Heating and cooling systems can use many different types of filters. The main purpose of an air filters is to keep your indoor air conditioning system particularly the evaporator coil clean. Some filters are also capable of cleaning the contaminants in the air creating better indoor air quality and greatly improving the general health of the occupants. The EPA rates indoor air pollution as one of the biggest health problem in America. To make problems worse the average person spends 90% of their time indoors. You may have seen some of these contaminants when a beam of sunlight illuminates them but the visible particles only represent about one percent of the contaminants in a home. Fact: The air in your house may be 5 to 100 times more polluted than the air outside you home according to the Environmental Protection Agency or EPA. Filtering Contaminants - The most common is an inexpensive mechanical fiberglass, aluminum or synthetic filter which is one inch thick and slides into the return air grill or furnace section of the air conditioner. This filter will only keep out large debris and should be replaced at least once a month. These filters only remove about 3 to 40% of these particles leaving the rest to contaminate your home and lungs. The technical definition of a mechanical air filter is any type of filter with a dry media. Mechanical air cleaners are in essence regular filters but some contain a professional grade filter that can remove many more contaminants than a standard fiber glass filter. 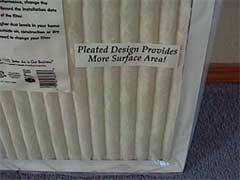 These filters will also remove animal dander and plant spores. Mechanical air filters trap dust on the filter element. They are usually 1 inch thick but are occasionally 2" or even 4" and can vary greatly in quality. Pleated Filters - Pleated 1" and 2" disposable fiberglass filters are very similar to regular fiberglass filters except they are normally more densely woven to increase efficiency and the pleats give more surface area so they don't have to be changed quite as often. 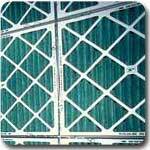 The 1" version can be used in most residential and commercial applications. They are a bit more efficient than regular filters but not as efficient as electrostatic, HEPA and electronic filters. Electrostatic Filters - Electrostatic filters consist of a large carbon filter on one side and a plastic or polyester material on the other side. As dirt passes through the layers an electrostatic charge occurs which attracts the dirt and traps it. Unlike mechanical filters they will remove very small particles. They are installed in the same way as the mechanical filters are but because the are more resistant they must be sized larger than a regular filter so they may require an oversized return air grill to operate properly. This calculation and installation should be done by a professional or if done incorrectly you may create a larger problem with your system. Electrostatic filters should be washed thoroughly with water at least once a month. An electrostatic filter is more durable than a regular mechanical filter and typically comes with a lifetime guarantee. Electrostatic filters are more expensive that mechanical filters, usually costing around a hundred dollars. Ultra Violet (Germicidal) Filters - Ultra Violet lights or germicidal lamps as they are sometimes called come in both hot plasma version which has a life span of 8,000 hours and a cold plasma version which has a life span of 36,000 hours. They produce UV light in the wavelength of 253 nanometers and produce UV C which can destroy the DNA of contaminants like mold and bacteria and keep them from reproducing. UV lights are not a filtration system and as such it does not remove any particles from the air so it should always be used with an air filter. Ion Generators - Ion generators produce negative ions that charge the particles in the air which attach themselves to any positive surface area. These particles attract negative particles like contaminants and cancel each other out effectively causing them to fall from the air. Sometimes these devices contain a collector tray to attract the charged particles back to the unit to cut down on soot on the furniture. Some of them also have a mechanical filter which can require replacement or cleaning on a regular basis. You usually need a unit for each room which can make them too expensive. Like UV lights it is not a particle removal system and only works when used with an air filter. Ozone Generators - Ozone generators designed to eliminate odors and kill bacteria are becoming increasingly popular but ozone in sufficient quantities is itself a pollutant and can cause shortness of breath and chest pain if allowed to accumulate. These generators are not recommended for long term use in a dwelling or other living space. Specialized Filters - Specialized filters are available like activated carbon for odor control or gas phase adsorption. Carbon and other adsorptive medias don't filter out particles and are only designed to reduce or eliminate gases and odors. Consult your service professional for special needs. Installing and Changing Filters - Filters should always be installed so that the air will flow goes in the same direction as the arrow on the filter. 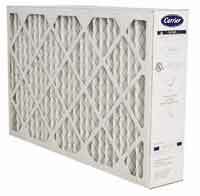 A correctly installed filter should fit tightly and securely to be effective. If most of the filter surface is covered with dust it’s time to replace it. Dangers of Improper Filter Maintenance - A dirty or undersized filter will restrict the airflow and cause your unit to malfunction or break down. Also your air return duct should be sealed inside and outside so that dirty unfiltered air won't contaminate the system. Also you should have from one hundred square inches to to one square foot of air filter surface in a normal system for normal operation. Most central heating and cooling systems are designed for a static pressure of approximately .5" to 1.0" including the ducts and the filter. If you install a filter with a high resistance like a electrostatic filter and the system is not designed for it you will slow down the air movement and reduce the efficiency of the system, possibly causing system freeze up or serious damage. Making the Right Choice - No air cleaning system can remove all contaminants from the air but the right choice when it comes to filtration can make a huge difference in the quality of the indoor air. One of the most effective methods is to combine a electrostatic filter, a UV light, and electronic air cleaner. Also air cleaners cannot remove pollutants such as dust, dander and pollen once they settle and are no longer airborne.